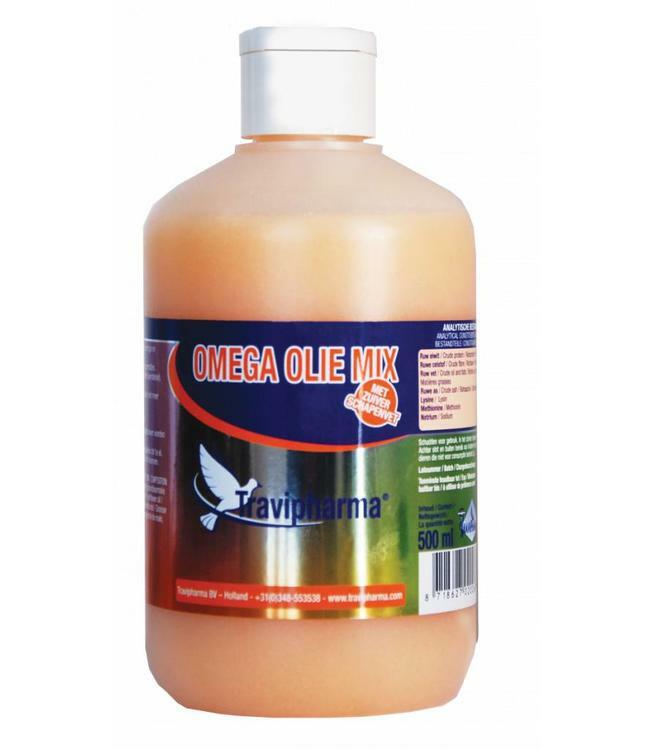 Omega Olie Mix is a unique energy source. It contains the pure scientific proportion of 3-6-9- fatty acids, which are purely natural, combined with pure sheep fat. It directly provides extra energy. It slows down inflammation and improves orientation (=home sooner). It also improves fertility and gives glazing plumes. It helps youngsters to develop better and get stronger muscles and tendons. Pigeons, cage, and aviary birds and small hobby animals. Pure sheep fat with natural oils, such as: salmon oil, maize germ oil and sunflower oil. Supplemented with vitamin B, E and C, Omega 3,6 and 9 and fatty acids. The ratio between omega 3 and 6 fatty acids is not more than 5 times more omega 6.